Debuting his new book, one Williamson County face greeted his readers with the wag of his tail and a paw print signature Thursday night. 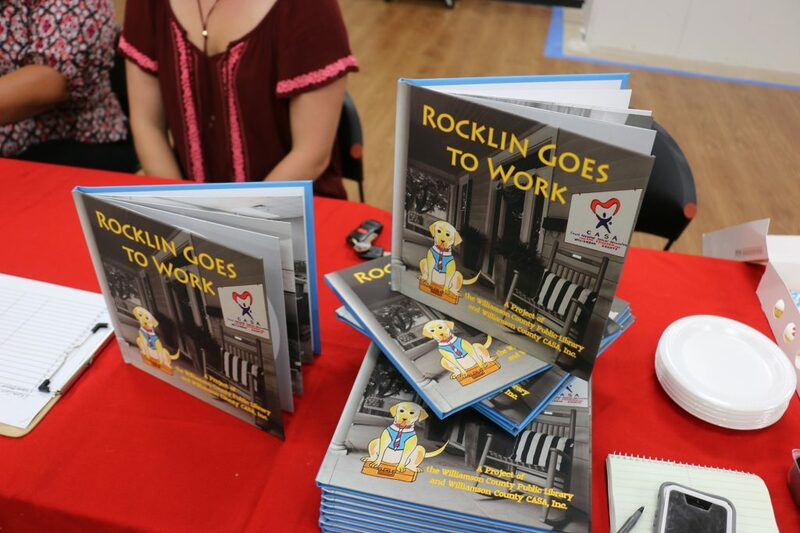 Court Appointed Service Assistant Rocklin stars in a new children’s book, “Rocklin Goes To Work,” based on what he does every day inside the Williamson County Courthouse. In partnership with the Williamson County Public Library, the local CASA nonprofit decided a book would be one of the best ways to reach out to the children they serve. CASA regularly helps kids in the county navigate through the court system, becoming their advocates and support. The group deals with kids experiencing neglect and child abuse, who have to face a legal or foster care situation. Rocklin, a golden retriever pup, provides a calming influence and a soft place to land when kids need him the most. Williamson County Public Library Director Dolores Greenwald greeted Rocklin with a pet and a kiss atop his head as soon as he walked in the door on Friday. Having the ability to self publish, the library routinely helps out nonprofits, but she said this one felt special. Those interested in reading the book can find it on the shelves at the Williamson County Public Library. Those who are interested in purchasing the book can do so through the Williamson County CASA site. Schroer said she hopes to ultimately place the book on Amazon for sale.